Learn how to homeschool preschool the easy way. Help your child learn through daily activities, our daily schedule, and how we homeschool preschool for free (or basically free). 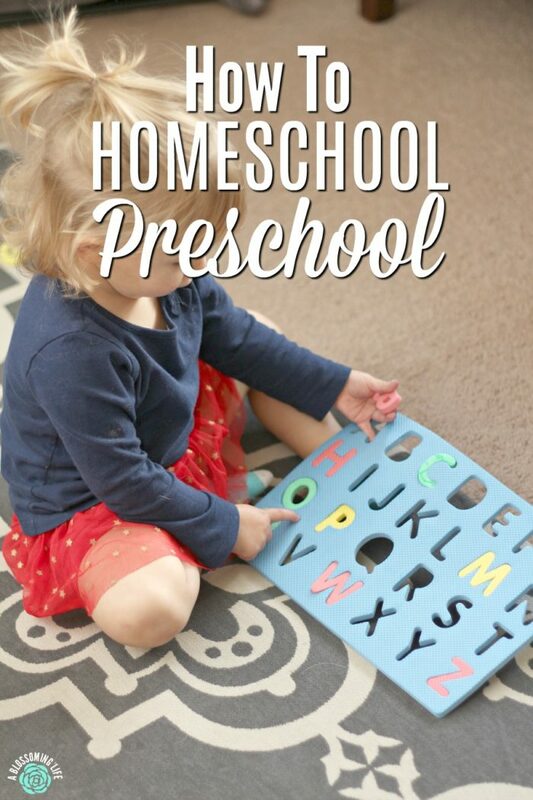 Follow my favorite homeschool preschool tips below. To homeschool preschool or not to homeschool preschool, that is the question. Many people believe you don’t really need to do a specific homeschool preschool curriculum and that children will just learn things on their own. But, I like – or should I say need – structure and to have a plan. I’m a free spirit, and since having kids, I’ve realized how much more productive I am with a little structure in my life. It makes me a much more sane person. Most kids start preschool around three to four years. We started after August was around 2 and a half years, because she seemed ready and really interested in learning. She gets really excited about learning the ABC’s and is trying to write them too (it’s no where near close, but hey she is trying). Every child is different. Back to school. Our plan is to eventually homeschool our kids, so why not start with preschool? I feel like it is a good prep for our family as we transition year by year into real homeschooling. There are lots of kits and programs you can purchase for preschool, but I don’t want to spend a ton of money, especially on preschool. Many of these things just naturally happen throughout the day. In my weekly calendar, I like to write out a few goals per day to make sure we hit that learning objective. For instance, I’ll just write under Monday “letters, #s, colors.” Tuesday might be “library, Bible, shapes.” Wednesday, “shapes, colors, #s, music. And so on. Many times we hit letters just by our everyday reading books. Here is a great list from Leap Frog of what kids should learn before kindergarten. These are things we are focusing on during the preschool years. Language: All the letters and their sounds. Start learning to read and write. They should be able to write their names before kindergarten. Math: Learning to count – up to 100 by the time of kindergarten, shapes, colors, time, temperature, days of the week/months, height, weight, and some basic math skills (basic addition and subtraction). Chores: I believe children should be a helpful part of the family unit, and learning to help out around the house fulfills this. So, we start teaching simple chores at an early age. August helps feed the dogs and brings plates to the kitchen. Play: Lots of fun learning happens during play, including outdoor play, nature walks, character building, etc. Character building: This includes being patient and respectful, learning to obey, be kind, having a good attitude, following instructions, and being helpful. This just happens with everyday life. What does homeschool preschool look like in our house? We read a lot, do crafts, play educational games and puzzles, and we play a lot. We spread out 30-60 minutes of educational time during the whole day. Most of the time, you probably wouldn’t know we are doing school. August usually doesn’t. The biggest thing we focus on is just having fun with an educational purpose. She really enjoys learning and asks to play certain games or do school herself. We read lots of books, between 5-10 books per day. This happens before nap time, bed time, and usually a story or two from the Beginner’s Bible at breakfast. Reading with children helps them become readers themselves, plus a million other benefits like quality time spent together, language development, and reading skills. We do this at least once a week. She enjoys story time (includes reading and singing songs), and then afterwards, August plays, colors, and looks at books with other children while I find new books for the week. Sorting game with cheap muffin tin from Dollar General and craft balls. We talk about colors and size. We talk about colors and shapes. I love to set her up with a craft while I’m trying to get food prepared or finish up cleaning. You can also do crafts using letters. The Dollar Store also has great educational coloring books. We play with play dough, make puzzles, glue things, and color lots and lots of pictures. 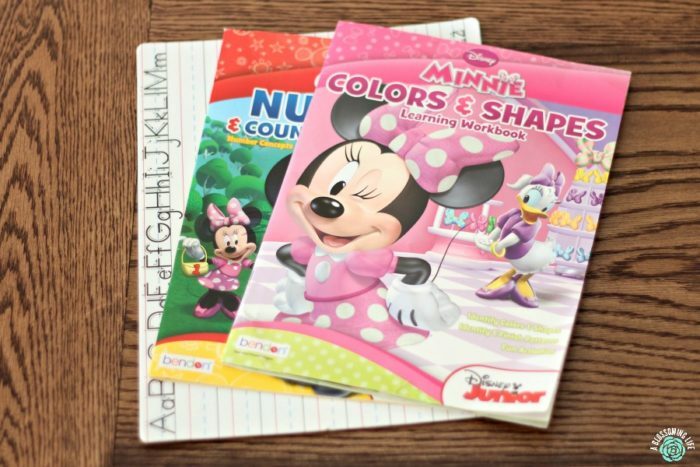 Easy Peasy (see below) has great educational coloring pages for preschoolers. 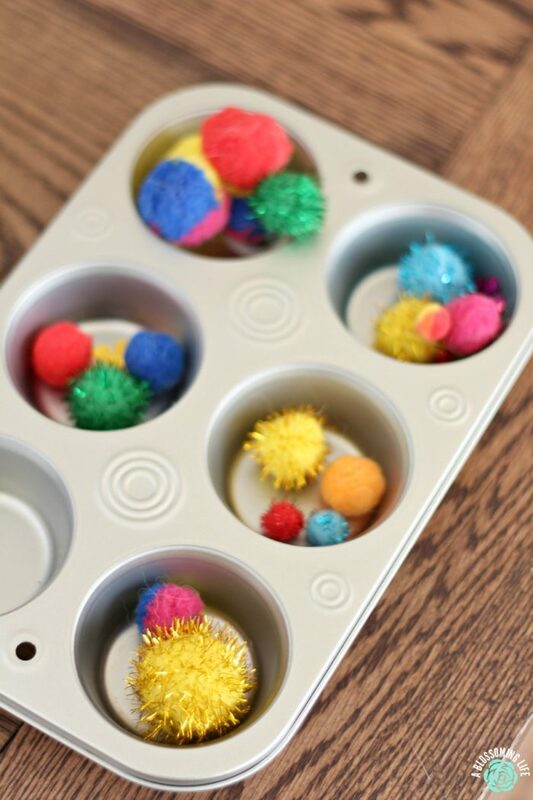 We also picked up some inexpensive muffin tins and craft balls at the Dollar Store to play sorting games. Read books that go through the alphabet. These are August favorite books. She asks to read them daily and loves learning her letters. Our favorite alphabet books are Eating the Alphabet by Lois Ehlert, and Dr. Seuss’s ABC. Also, she loves the letter games on Startfall.com. Some mornings the first thing out of her mouth before “hi momma” is “can I play my letters game on the computer?” How can one say no? Throughout the day we count things: how many bananas are we buying, cards do we have, balls, pipe cleaners, etc. We also like to look at books that have numbers and counting in them. Most of our day focuses on play. Kids do a lot of their learning by just playing with you, their friends, and by themselves. We usually meet up with friends a few times a week. Plus lots of play at local parks or the indoor park during the winter. Get that energy out, socialization, and learning to share with others. Win, win. We are always trying to find fun things to do that don’t cost an arm and a leg. Luckily, we live in an amazing place that is close to a few cities with lots of fun things. We like to visit the ocean, go hiking, go to the aquarium, the zoo, local farms, etc. We’ve been using Easy Peasy program for awhile now and love it. It’s a free online curriculum from preschool through high school that we have been really enjoying. 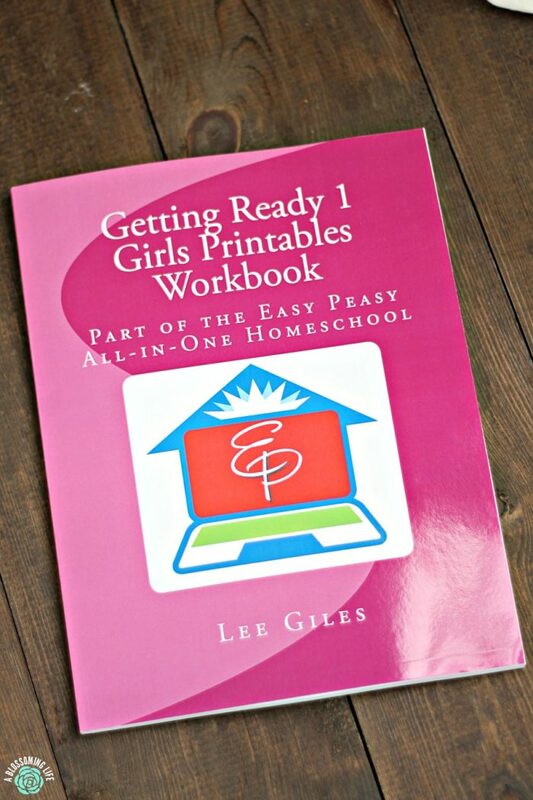 You can also purchase many of the workbooks (the way I prefer and is still really affordable). We’ve been going through Getting Ready 1 and then Getting Ready 2 is the next step which is there version of kindergarten. This is forever changing, and will change by the week but here is a basic run down of how our homeschool preschool schedule. Remember your child continues to learn throughout the day while doing regular activities. 7 AM – Wake up, eat breakfast together as a family. 8 AM – Play (build with blocks or Magnitiles, color, do a sensory activity (kinetic sand, cloud dough, or play dough) while I finish working. Craft. Sometimes she gets to watch a show. 8:30/9 AM – School “lesson”. Do a few worksheets from one of our education books and/or do a lesson provided in Easy Peasy. Discuss topics of the day and play with small educational toys that we can’t play with when the baby is awake. We love these Pattern Blocks and Boards or these lacing beads. 9:15/9:30 AM – Get ready for the day. Work on basic life-skills like getting ourselves ready, using zippers, putting shoes on etc. 9:45 AM – Fun time or errand time. Go to the library, park, a hike, a friends house, have a friend over, or do errands. If we stay home then we will just have free play or do crafts. 12:15 PM – Read and nap/rest time. Most days my preschooler will nap, but on the days she doesn’t we take quiet time where she is allowed to play and read in her room quietly. 2:30/3 PM – Kids are up. Snack time and play time. 3:30/4 PM – Go for a walk if it is nice enough outside and talk about nature. Observe the changing seasons, what is blooming, look at the different leaves trees etc. 5 PM – Make dinner. Kids may get to watch a show. After dinner is daddy fun time. 8:30 PM – Read and then go to bed. That is it. It can change from day to day and of course it changes as she gets older. Everything is basically a learning activity at this age. If you preschooler is so over it that day, don’t force it. It’s okay to take a few days or weeks off. There are times where my preschooler doesn’t want anything to do with school. That is totally fine, and eventually she asks for it again. School and learning should be fun, especially at this age, so don’t force it. Play, play, play. Try new things, have fun, and go on lots of adventures. Talk about everything. We love learning and exploring. We frequently look up new information. Try to keep screen time to a minimum. Some days are better than others and I can definitely be guilty of doing too much screen time on days. Thankfully that is what grace is for. Did you do homeschool preschool or send your kids to preschool? Whatever your situation, I would love to know your experience! We started homeschooling when our oldest was in third grade. We’re now in our tenth year of homeschooling. The oldest is done with his k-12 education. He’s taking a year off school to develop a video game and determine if he wants to pursue a degree in Video Game Design or not. The oldest has always been a very curious young man and we found interest-based learning worked well with him. The younger two 8 & 6 have always been homeschooled. For the preschool school years, we do not do a formal curriculum. They learn about colors, shapes, letters, and numbers from everyday activities. Our middle child spontaneously started reading at 4 years old. Our youngest is 6 and still not reading. I’ve decided to develop a structured reading curriculum for her pulling from several others that I have seen over the years and adding some things of my own creation. The great thing about homeschooling is we’re able to cater to each child’s individual learning style. We can cater to their interests so that learning can remain fun for them. Another thing I love is if I try something that isn’t working I can switch it up and pursue something else. Thanks for sharing Amy! That is so true! I love the flexibility of it and being able to “educate” all the time in the way our children learn best. I love learning knew things from seasoned homeschoolers like yourself. Keep up the hard work! We have started this also. Thank you for posting some resources! I am working on a spreadsheet for fieldtrils for this spring and summer when the baby is easier. Would love your input!! Erin! I have no idea how I’m just seeing this! Funny since we were just talking about this yesterday! If you ever want to go on some field trips let me know. We got a zoo pass this year woo hoo!